The ten artists in WAM's upcoming exhibition Ordinarily Here are busy installing work in advance of the show's opening on June 19. This week, artist Elizabeth Simonson installed two of the three pieces she's contributed to the show. One of them, Synura, is made with the very common material of cellophane tape layered on itself and attached to the gallery wall. Simonson created this work specifically for this show at the Weisman. For this work, the tape, taken out of its usual utilitarian context, is transformed both in color and form. Synura, referenced in the work's title, is a golden colored algae that forms swimming colonies from a variable number of cells joined together at their posterior ends in a spherical or elongated cluster. Be among the first to see all the work in Ordinarily Here at a free preview party on Friday, June 18. The event runs from 5:30 to 8:30 p.m. and features complimentary hors d'oeuvres and a cash bar. Local DJ Lori Barbero provides the music. Elizabth Simonson received her BFA from Hunter College in 1996 and her MFA from Hunter College in 1999. Elizabeth Simonson's work is based on investigations of mathematical systems that replicate the patterns of ebbing and flowing tides. 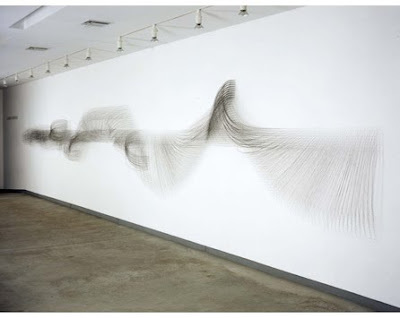 In 2002 she began to make hybrid drawings of rhythmically inflected, parallel strips of masking tape; her made-on-site drawings now include wall-mounted compositions of thin wire, as well as patterns of cuts made in large, rectilinear sheets of black foam. In each case, she begins a task, anticipates its direction, and follows its lead as the composition unfolds and defines itself. 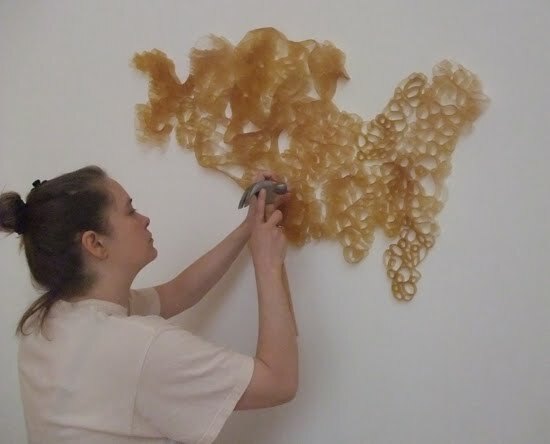 She has exhibited internationally at Livingroom-D-lyx, Malmö, Sweden, Plane Space, New York, Post Gallery, Los Angeles, CA and The Soap Factory, Minnneapolis, MN. Her work is included in the collections of The Museum of Modern Art, Goldman Sachs and Hunter College in New York City. Her work has been reviewed in publications that include The New York Times, Art in America, The Brooklyn Rail and the Village Voice. Elizabeth Simonson currently houses her art studio in the Historic Thorp Building & CBC in the NE Minneapolis Arts District in Minnesota.